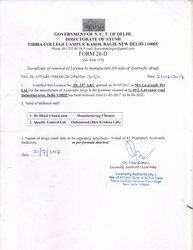 We 'La Nutraceuticals' established in 2009 are manufacturers, suppliers and exporters of Multivitamin & Multi-Mineral Capsules, Multivitamin & Multi-Mineral Syrup, Food Supplements more. 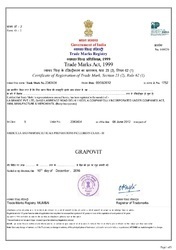 We also provide Third Party Contract Manufacturing services. 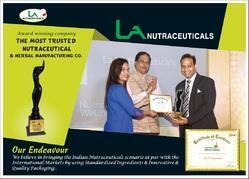 LA Nutraceuticals is a division of La Grande Group which is a 35 year old firm. We aim to provide combination of the best of nutraceuticals like Grape Seed, Astaxanthin, Zeaxanthin, Co-enzyme Q10, etc. herbs from AYURVEDA as well as Internationally used herbs like Ginseng from Korea/China, Sylimarin from Mediterranean, Bear Berry from Europe for working towards good health and happiness for all. Our exporting countries are Indian Subcontinent, East Asia and Middle East. 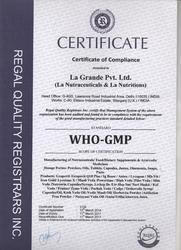 Our world class manufacturing facilities are GMP (GOOD MANUFACTURING PRACTICES) an ISO 9001:2008 CERTIFIED. We use Standardized Herbs and all our products pass through strict Quality Control Checks. Our company has achieved its goals & objectives under the able mentorship of "Mr. Ankur Gupta (Manager)". We have combined the merits of Indian Ayurveda with best international herbs and latest antioxidants. Our antioxidant products provide health and wellness and fight modern lifestyle diseases (Cancer, Diabetes, obesity, Thyroid, Hormonal and Chronic problems). Our organization has been endowed with a sound production unit where all processing operations take place. 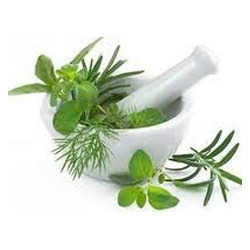 The chemical engineers, dietitians and health care professionals work with each other to ensure that the Herbal, Pharmaceutical and Neutraceutical Products formulated by us are completely safe and do not cause any side-effects. 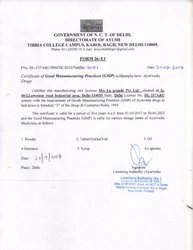 Only latest processing machines and blast furnaces are used at this facility to ensure that medical products having accurate composition are formulated at this unit. We have set up an exclusive warehousing and packaging unit which is replete with shelves and material handling equipment to store and transfer the raw material and finished products, respectively. This unit is temperature controlled so that the medicines can be stored in the ideal manner and all requisite fire safety equipment are placed here in case of fire-related hazards. Only premium grade packaging material is used while packing the medicines to maintain their chemical balance and pureness. Being ideally located, this facility allows us to make sure that the cargo are delivered to the clients within the given time span. 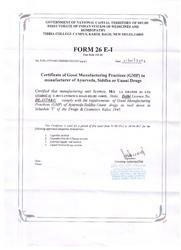 We have a GMP AYUSH certified unit and cater to 3rd party manufacturing for all dosage froms: Capsules, Liquid orals, Powders. 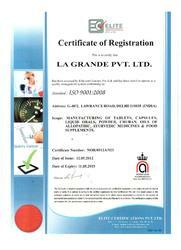 Our Food supplement unit is FSSAI licensed as well as Products FSSAI approved.